It's a new season, and with it comes new styles, and new clothing. What can you do with your clothes to reduce waste going to landfill? Clothing, shoes and fabrics in good condition can be swapped, donated or sold to someone else who can re-use them. You can also mend or alter your clothes to create a new look. Did you know that you can also recycle your old textiles that are just too worn out for re-use? Talking about waste as a community is one of the most important parts of the Waste Free Challenge - when we work together, our impact can be huge! TEA has partnered with CASSA - the Council of Agencies Serving South Asians - to promote the Waste Free Challenge in the South Asian community. This week, the CapaCITY Creators team launched a Waste Free Guide to Hosting a Dinner Party with a waste free picnic in Scarborough (photo). The Waste Free Challenge has shown us great ideas about reducing waste at home, but the Challenges can also apply to community groups, schools and offices! As a Team, TEA will be taking the Waste Free Challenge in our office - things like Measuring Our Waste, dealing with our lack of Green Bins and recycling our e-waste. Will your office join us? The Repair Cafe is a great non-profit group that is helping Toronto reduce waste and build the skills to go Waste Free! The monthly Repair Cafes are held across Toronto and volunteer 'fixers' offer free (by donation) services to help you repair what you have, and also build skills to repair it yourself! They aim to "build a more sustainable society and counter the throwaway mindset." Got an old shirt with missing buttons? A favourite bag with a torn handle? Don't toss it out - repair it! This Saturday morning at the Evergreen Brickworks farmers market, check out the Repairathon: Volunteer-menders will help you repair your clothing and fabrics - keeping it from landfill and saving money. Done with that book? Looking for a good summer read - check out Swapsity's Book Movie Music Eco-Swap this Sunday at the Harbourfront! Swapsity is a community dedicated to promoting 'collaborative consumption' and reducing waste by swapping and sharing what you don't need anymore with someone else. In three years, Swapsity has organized over 27 swap events, saving over 30,000 items from landfill and saving Torontonians an estimated $200,000! The best way to reduce waste is to avoid it in the first place. By sharing things, swapping what we don't need anymore, and repairing what we have we can avoid buying 'stuff' and build community at the same time. Toronto hosts a whole range of great community initiatives to share, swap and repair! 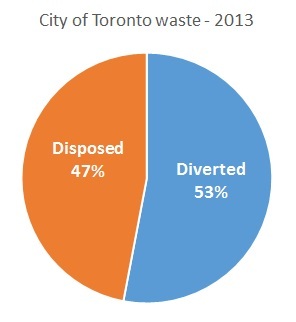 Toronto's garbage future: burn, bury or recycle? The City of Toronto sends almost 500,000 tonnes of garbage to the Green Lane landfill each year - just under half of all of the waste collected in the city. If Toronto continues at this rate, Toronto's Green Lane landfill will be full by 2026. This summer, the City is looking at what to do over the next 30-50 years with Toronto's growing garbage and a key issue is whether to bury garbage in a new landfill, or to burn it in an incinerator. However, based on City waste statistics, we know that a lot more can be done to reduce, reuse and recycle it in the first place.